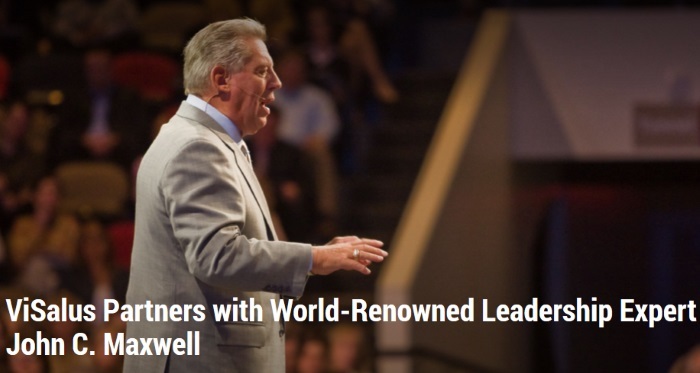 Los Angeles, CA –August 28, 2014 – Taking Vi leadership into the future, ViSalus announced a strategic partnership with renowned leadership expert, speaker and best-selling author, John C. Maxwell. As a global initiative, Maxwell will collaborate with the ViSalus Founders to provide Vi Promoters with an indispensable resource known as the Leadership & Influence Development (LID) program. Along with this program, Maxwell will further build the company’s leadership vision as the keynote speaker at Vitality, ViSalus’ global celebration, taking place September 12-13 in Houston, Texas. Maxwell has trained more than 5 million leaders worldwide, written more than 60 books, and is ranked #1 in Inc. Magazine’s Top 50 Leadership and Management Experts. He brings a bank of knowledge and expertise to a company with a strong history of breaking boundaries. “A leader who produces other leaders multiplies their influences,” stated Maxwell. The LID program kicked off with the first of three annual meetings in Atlanta this June, bringing together top ViSalus leaders to form an exclusive group. The members of this Founders’ LID Group have earned the opportunity to work directly with Maxwell and the ViSalus Founders over a 12 month period. LID teaches Promoters specific leadership skills that they can use to not only raise their own leadership “lid,” but duplicate that success throughout their teams. Vitality 2014 will see thousands of Vi Customers and Promoters from all over the world come together to celebrate the next exciting chapter of the Vi story. ViSalus Co-Founder and CMO Blake Mallen will present on the cutting-edge technology revolutionizing the PROJECT 10™ Challenge as well as announce the launch of their new products, while ViSalus Co-Founder and Global Ambassador Nick Sarnicola will discuss promotional strategy and entrepreneurship. In addition, Maxwell will address the entire Vi Community, inspiring thousands while highlighting the company's vision for the future. ViSalus, Inc. is a healthy lifestyle company that is dedicated to Challenging the World… 10 lbs. at a Time. Founded in 2005, ViSalus develops high-quality weight-management products and nutritional supplements that it markets and sells direct-to-consumers through an international sales force of independent promoters. ViSalus markets its products in North America under the ViSalus® brand and in Europe under the Vi™ brand, through the Body by Vi Challenge®. ViSalus is headquartered in Los Angeles, California and Troy, Michigan and is majority-owned by Blyth, Inc. (NYSE: BTH). For more information about ViSalus, please visit Vi.com and follow the Vi-Community on Facebook (Facebook.com/Vi) and Twitter (@ViSalus).